Leave room in your suitcase on your Isle of Palms vacation because the area is an excellent shopping destination! Whether you’re looking for a cute new outfit, a decorative piece for your home, or the perfect memento to remember your vacation, you’ll find a variety of excellent specialty stores, shopping centers, and boutiques to suit your needs! Take a look at our list of the best places for Isle of Palms shopping below. If you’re looking for more things to do on your vacation in addition to the best Isle of Palms shopping, access our free Vacation Guide! As local experts of the area, we want to share with you our top recommendations for activities and attractions. We’ve included the best restaurants, bars, sightseeing, outdoor activities, and more. This guide is the ultimate resource for all things Isle of Palms. Get your copy today! Island Time Beach Shop is one of our favorite gift stores on the Isle of Palms. With all the beach essentials and souvenirs you could need, it’s a great one-stop beach shop. You’ll find unique gifts, local art, and classic souvenirs at this casual, oceanside spot! Another lovely gift shop on the Isle of Palms, My Favorite Things is home to a wonderful selection of treasures and collectibles. From seashells and keychains to t-shirts and mugs, there’s a little something for everyone here. My Favorite Things is located just across the beach, so it’s the perfect place to pop in when you’re looking for a shady retreat. Be sure to say hello to Bubba, the friendly parrot who lives in the gift shop! Voted Charleston’s Best Shopping Destination, Mount Pleasant Towne Centre features over 60 shops and restaurants, a movie theater, and special events and pop-up shops. Located just a 20-minute drive from the Isle of Palms, the shopping center is easily accessed from all of our East Islands Rentals properties. Enjoy upscale boutiques, name brand stores, specialty shops, and more. Take a look at the directory for a full list of shops and restaurants. Elizabeth Stuart Design is an elegant boutique with beautiful furniture, jewelry, and accessories. Located in Mount Pleasant just off Coleman Boulevard, the charming shop features an eclectic mix of home decor including comfy chairs and sofas, decorative lighting, pillows and throws, garden items, and lovely artwork. In addition, you find handmade jewelry, a small selection of comfortable and classy clothing, and unique accessories. Almost Pink is a Sullivan Island’s favorite boutique featuring trendy and affordable women’s clothing. A family owned and operated shop, Almost Pink has several locations throughout South Carolina as well as an online shop. Take a look at their Instagram @almostpinkshop to see current offerings! For the perfect place to stay during your getaway, book your vacation accommodation with East Islands Rentals! 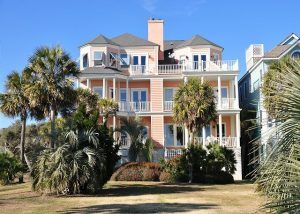 All of our beautiful homes are within close driving distance to the best Isle of Palms shopping and attractions. One of our favorite homes that we know you’ll love is 14 Grand Pavilion. This beautiful oceanfront home sleeps eight and features a fabulous community pool! Enjoy spectacular views from all three stories of this stunning home. As part of the Wild Dunes community, you’ll have access to countless resort amenities! It’s the perfect place for a fun and relaxing family getaway. Check availability of all our properties now and book the perfect stay today! We can’t wait to host you!